It’s still a few days before you have to put your April Fool’s Day pranks into action, so make it a good one this year. I’m sure you’ll come up with something extra special. In the meantime, there’s been some foolish behavior on the music charts for years, from dancing fools to fools in the rain. We’ve kissed them and believed them. We’ve even questioned ourselves about being the fool. Everybody plays the fool, and we played these records a lot, even if they didn’t peak around the Day. (Some of them indeed did.) So, instead of my yapping and fooling around, I present to you the Friday Forty: The Top 40 Fools of the Rock Era. Not just a “Little” hit. 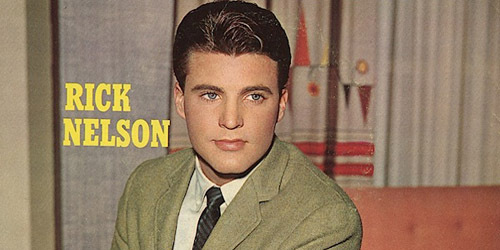 Teen idol Ricky Nelson blew up at an early age, starring on the 50’s sitcom The Adventures of Ozzie and Harriet along with the rest of his family. In 1957, Nelson began his recording career with a #1 album, Ricky, and a #2 single, “A Teenager’s Romance”. “Poor” was issued in the spring of 1958 and went to #1 for two weeks in August. It holds the distinction of being the first #1 song on the then newly introduced Billboard Hot 100 chart. Nelson had a number of big singles into the early 60’s, but by the middle of the decade, his success experienced a sharp cutoff. “Garden Party” became his final top-40 hit in 1972, peaking at #6, his biggest single in nearly a decade. He had 35 top-40 hits total. Nelson died in a plane crash on New Year’s Eve, 1985. “Somebody” familiar to the top ten. 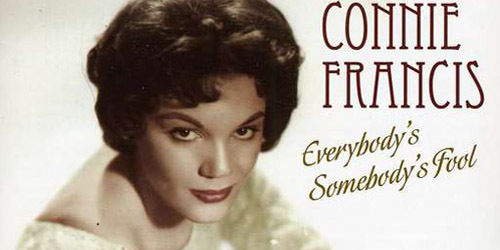 She was on the last Friday Forty about fashion-themed hits, and now, Connie Francis is back again. Like Nelson at #5, Francis also hit the charts for the first time in 1957 with the #4 “Who’s Sorry Now?” but her track record was a little more inconsistent. “Everybody’s Somebody’s Fool” was originally the b-side of another single, “Jealous Of You”, which only went to #19. However, in this rare case, the song that was demoted to a b-side actually went to the top spot, spending two weeks there. Francis followed it up with “My Heart Has A Mind Of Its Own”, which also went to #1. She last hit the top 40 in 1964, but she occasionally made the Hot 100 until the end of the decade. Francis is now 74 years old and sometimes performs. Couldn’t quite “Beat” the top two. 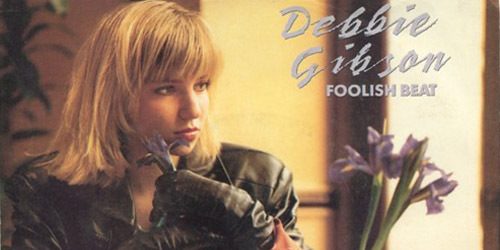 New Yorker Debbie Gibson wanted to make it big very young, performing in community theater and playing multiple instruments. In 1987, Atlantic Records signed her, and her debut album Out Of The Blue became a multi-Platinum success. This fourth single from the effort became the only #1 hit from it, and, at the tender age of 17, made her the youngest act to write, produce and perform a chart-topping single. Electric Youth, released in 1989, went to #1 on the Billboard 200 album chart on the strength of “Lost In Your Eyes”, but her sales slowly diminished at this point. Gibson last cracked the national charts in 1993, though she’s made some genre-specific surveys since then. She still performs today; in fact, I’ll be seeing her on April 12 at a local event here. After two big singles from her Pieces Of You album, this dark track from the Batman & Robin soundtrack was one of two from it to make the mainstream radio chart. (The other was the mid-charter “Gotham City” by R. Kelly.) “Foolish Games” spent four weeks at #1 in the fall, the most out of any song on the list. Jewel scored hits for a number of years afterwards, including 1998’s “Hands” and 2003’s “Intuition”, and also leaped into the world of Country music. Still, her days of big national hits are behind her. She recently put out a Greatest Hits album and a new song from it, “Two Hearts Breaking”, is receiving some minor airplay at the adult contemporary format. She’ll be on tour through the late spring and early summer. Now, the most foolish of the fools at #1 on the countdown. 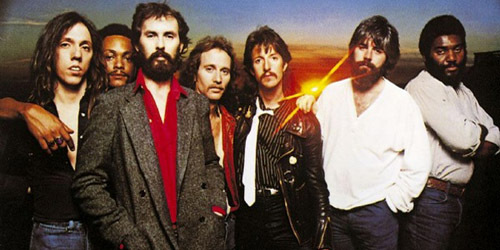 After lead singer Tom Johnston fell ill in 1975, The Doobie Brothers took on a different sound with new leader Michael McDonald. “What A Fool Believes” was the first single from Minute By Minute and was a huge and unexpected hit, spending three weeks at #1 on the airplay chart (including over April Fool’s Day) in the spring of 1979. (It only spent one week atop the Hot 100.) The group had a handful of other charting singles, then disbanded in 1982, until they reunited in 1987. They managed to take one more single into the top 40, 1989’s “The Doctor”, though McDonald had left the band at that point. The group still tours today with different lineups and Johnston reinstated as lead singer. Thanks for logging on and checking out another of the Friday Forty posts and if you have any suggestions for themes or a favorite song on the list, let me know! Post away in the comments or find on Twitter: @AdamFSoybel.